In October 2006, North Korea, crossed a weapons threshold by detonating its first nuclear bomb. This drew international condemnation that put then South Korean president, Roh Moo-hyun, in a very uncomfortable position because of his attempts to diplomatically approach the North. His chief of staff was a man named Moon Jae-in. In the United States in 2006, real estate mogul and entertainer Donald Trump was ‘firing’ people on his successful reality TV show, The Apprentice. Given the circumstances, it seemed very unlikely Moon and Trump would ever cross paths. Using this nuclear test as a starting point, the presidential administrations of the United States and South Korea, in terms of political ideology, have coincided for only two years, in 2007 and 2008, when George W. Bush and Lee Myung-bak, both conservatives, were the respective leaders. After that, Presidents Obama and Trump in the U.S. and Lee, Park and Moon in South Korea have belonged to different side of the political spectrum. However, despite their ideological differences, the previous leaders were all able to maintain agreement publicly in the face of North Korean aggression. That is until now. In the face of North Korean aggression, President Trump is undermining his South Korean counterpart over security and economic issues at a time when public solidarity is needed more than ever. As a result, President Moon’s opportunities to craft his own North Korea policy, which he touted as distinct from a policy of only following America, are growing scarcer. Optics are important in international politics, and the image of the South Korea/America alliance do not inspire confidence in its current state. In order to address the North Korean issue most effectively, the presidents of South Korea and the United States need to shore up their own relationship first. 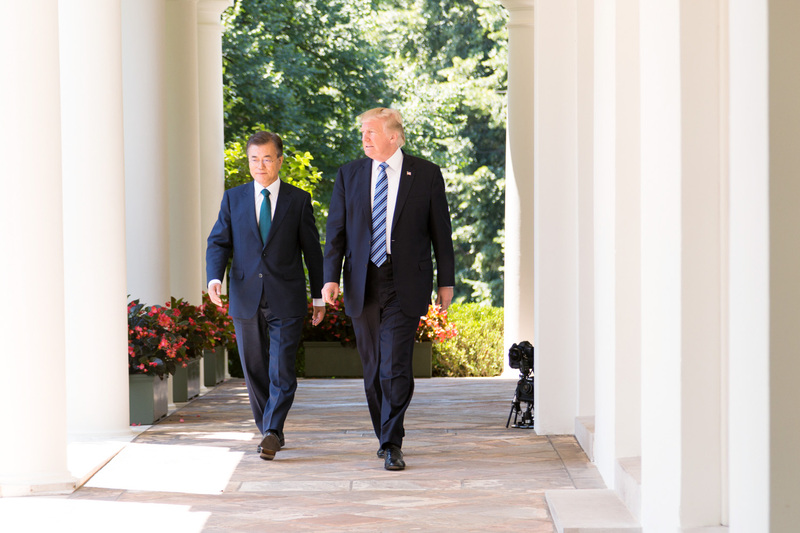 Domestic politics vary in different countries, and even allies have different political goals, but the current rift between Washington and Seoul is different from past instances of progressive/conservative conflicts. After a nuclear test, normal disagreements are usually set aside to show solidarity. Although Presidents Bush and Roh had a heated exchange over how to diplomatically approach North Korea, President Bush did not attempt to humiliate his counterpart publicly like President Trump has done through social media to President Moon. Trump’s social media use is emblematic of the overall distance between Moon and Trump in terms of demeanor and political approach. President Moon, a former human rights lawyer and son of parents born in North Korea, was a key player in former South Korean President Roh Moo-hyun’s administration, known for its Sunshine Policy. During that time, humanitarian assistance from the South crossing the 38th parallel to the North increased drastically, with hopes that Pyongyang would lessen its aggressive rhetoric. Moon also ran for president in 2012, lost to Park Geun-hye, and was then elected in 2017 after the impeachment of President Park. Across the Pacific, President Trump, the son of a successful real estate developer, went into his father’s business and built it into a global brand. Although his name was in the political world before, his runs for office were never considered seriously. He later used his lack of political background as a selling point to voters who wanted a change from establishment politics. President Moon’s demeanor is calm and measured, whereas President Trump has built a reputation through brashness and pomp. For example, early in his presidential campaign he stated that he didn’t need lobbyists or donors because “I’m really rich, I’ll show you that”. All of this led to some apprehension before the two met for their first summit in late June 2017. However, according to the media in both countries, it went smoothly and the two different personalities did not appear to clash. The problems began the next week when North Korea crossed another weapons threshold by launching its first ever intercontinental ballistic missile (ICBM), meaning it developed means to deliver its nuclear capabilities to continental US. Shortly after, President Moon then gave his ‘Berlin Doctrine’ speech in which he said he was ready to meet Kim Jung Un “anytime, anywhere”, although “this was the last chance for North Korea to make the decision [for talks]”. In mid-August, after North Korea launched its second ICBM, the response out of some military and government circles in Washington D.C. openly talked of military strikes. President Moon challenged this by saying that if the U.S. wants to declare war, it must seek permission with South Korea first. Then, on September 4, when North Korea detonated its most powerful nuclear weapon to date, the fissure between Trump and Moon became unavoidable. President Trump made his usual overtures to Kim Jung Un, imploring him to stop or face the consequences, but he then proceeded to target President Moon by tweeting, “South Korea is finding, as I have told them, that their talk of appeasement with North Korea will not work…”. On top of that, later that week he announced that his administration might scrap the Korea/US Free Trade Agreement (KORUS FTA). This was unprecedented. Although there has been tension in the relationship, standard protocol had been putting political differences aside in a show of unity against North Korean aggression. Their speeches to the United Nations General Assembly reflected this as well. As Trump mentioned that the U.S. might have to “totally destroy” North Korea, President Moon said that he is ready to “assist” North Korea if it peacefully gives up its nuclear program. The same day, Seoul announced $8 million in aid to the North through UNICEF. At this point, the two are essentially a disconnected, yin and yang but this time not complementary. To be fair, the problems between Seoul and Washington started before Moon Jae-in became president. The THAAD system controversy beginning in 2015 and candidate Trump’s repeated calls for South Korea to pay more for American soldiers stationed in the country caused early friction. President Moon’s foreign policy stance towards the United States was playing catch-up with other countries in the region because South Korea’s late spring 2017 election meant the new president could not meet Trump until June. When they actually did meet, the American leader already had impressions of North Korea from Prime Minister Abe of Japan and President Xi of China, both of whom he had met months before. As he already had an idea formed by the Japanese and Chinese leaders, it may have been difficult for President Trump to hear about the situation from the South Korean perspective. For instance, after his first meeting with President Xi in April, the American president had two notable quotes, “After 10 minutes, I realized [that a solution for North Korea] it’s not so easy,” and also said, “Korea actually used to be a part of China.” Both were surprising and a tad alarming to foreign policy circles, especially in Seoul. What are some consequences of this current public image crisis? On the South Korean side, despite criticism from right-wing politicians, President Moon has been stern in his responses to North Korea. He openly condemns Pyongyang’s aggressive action and replies with shows of military strength of his own. However, this has yet to be acknowledged by President Trump. One person likely looking on this situation with satisfaction is Russian president Vladimir Putin. Originally a proponent of dialogue between the United States and North Korea, Putin is now capitalizing on President Moon’s search for avenues of approach to the North. The Russian president has said he would be a willing facilitator between the North and South. At the Eastern Economic Forum at the beginning of September in Vladivostok, Russia, Putin and Moon denounced North Korea’s nuclear tests together, but agreed that aggression is not the answer, proposing joint projects in infrastructure development that could help North Korea. The long-term consequences are still unfolding, but what is certain is that no one likes to see a rift between Washington and Seoul more than the leadership in Pyongyang, and to a lesser extent, China. North Korea has been trying for decades to pry loose the relationship between South Korea and the United States in order to make the power balance on the peninsula closer to even. Jung H. Park of the Brookings Institution posits that the rift is caused by differences in the two leaders’ thoughts about whether North Korea has actually “ignored or rebuffed” all of South Korea’s attempts at engagement. If the leader of the United States, South Korea’s most important ally, publicly dismisses the opinions of Seoul, North Korea has no grounds to take South Korean communications seriously. As for China, the presence of American soldiers in Japan and Korea is seen as an impediment to its rise as the preeminent power in the Pacific region. Right now, any loss in trust between the United States and South Korea is a gain for North Korea and China. Overall, President Moon is finding out the hard way that implementing a North Korea policy of his own is very difficult. Despite his repeated offers for dialogue with Pyongyang, he has been ignored. North Korea frames the situation as United States as the imperial nation and South Korea the colony, meaning Pyongyang wants to deal directly with Washington. As long as North Korea increases its range of weapons capabilities to strike the United States directly, no one expects Washington to play a secondary role in response to threats. This means things South Korea would like to control are becoming more difficult, like the possible reopening of the Kaesong Industrial Complex, located in North Korea but operated by South Korean companies. Ironically, President Moon wanted more independence from the United States to deal with North Korea, but because of North Korea’s actions, he finds himself more and more bound to America’s North Korea policy. His ability to chart his own path to Pyongyang hinges on a careful balance of persistent offers of dialogue and humanitarian aid with the North, while also presenting a strong and united front with the United States, South Korea’s security guarantor. The United States and South Korea have seen themselves as the leaders in the international campaign against the current North Korean regime. But as North Korea develops its weapons program that now puts mainland United States within reach, coupled with radical changes in American politics, Seoul has to fight harder to make its voice heard. It does not want to sit in the passenger seat on the North Korea issue. Another opportunity for President Moon to speak up is when President Trump comes to Seoul for his first state visit to South Korea tomorrow. Besides meeting with President Moon at the Blue House, Trump is scheduled to speak at the National Assembly. As the topic of North Korea will certainly garner the most attention, the question is if he will be more conciliatory with President Moon, or possibly appeal to South Korea’s more conservative parliamentary politicians, who also feel Moon’s approach to the North is soft. President Trump should not use this time in the spotlight to further publicly undermine President Moon any further, but rather acknowledge their differences and highlight the strengths of cooperation. In order to effectively lead the international community against aggression from Pyongyang, these two leaders must coordinate effectively with each other first. This means President Moon must find the right way to express to President Trump that South Korea is a key pillar in America’s North Korea strategy. Even if the two presidents endorse different approaches, effective coordination can accommodate both. Nate Kerkhoff is the editor-in-chief of NOVAsia and is in his fourth semester with the publication. His hometown is Overland Park, Kansas and he studied international relations at the University of Nebraska-Lincoln. During his time at GSIS, he has been associated with various organizations, including the UniKorea Foundation, the North Korea Review, and the Daily NK. He also worked at the 2018 Pyeongchang Winter Olympics. His articles have appeared in the Global Politics Review, East Asia Forum, NK News, The Interpreter, International Policy Digest, Real Clear Defense, Channel News Asia, The National Interest, and the Kansas City Star. Additionally, he is a Young Scholar at the Pacific Forum. 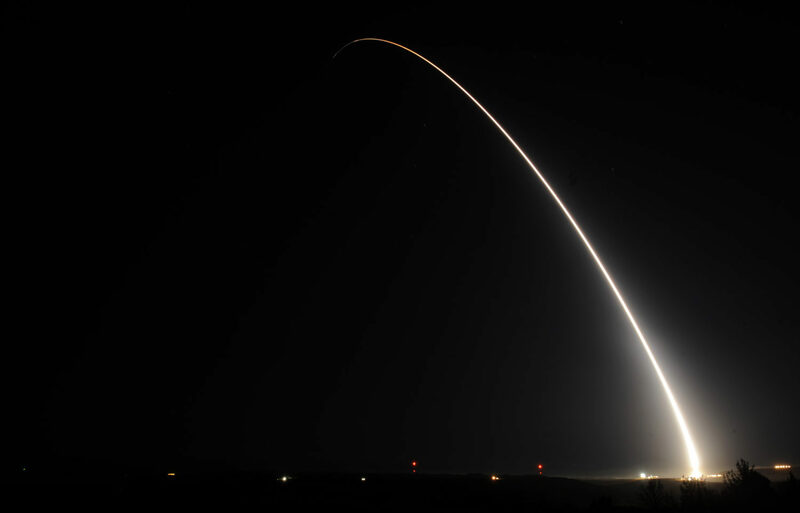 North Korean ICBMs: Game changers at home?